Whilst equity indexes have battled slowly higher this week, the VIX has remained stuck in the 15/13s, settling today -1.7% @ 13.92. Near term outlook is for a renewed push higher, at least to the 17/18s.. if not a brief test of the big 20 threshold. With the big monthly jobs data tomorrow, there is a viable chance the VIX will open lower, but with each day, there is increasing chance of a renewed push higher. What is also clear... equity bears are going to find it really tough to break and hold above the 20 threshold in the remainder of this year. It was another day for the bulls, with new historic highs in the Trans, Dow and sp'500, which settled +7pts @ 2031. The two leaders - Trans/R2K, settled 1.3% and 0.4% respectively. The broader hyper ramp from the mid October low continues, but a retrace is unquestionably overdue. .. suffice to say.. a pretty dull day.. not least with it turning into algo-bot melt this afternoon. the usual bits and pieces across the evening, to wrap up the day..
Little to add.. on what has been a particularly frustrating day. I can only hope we see some degree of turn tomorrow, otherwise it make for a rather boring end to the week. Viable micro double floor of 30.33/32.. a close in the 32s looks possible. The leveraged miner ETFs continue to see HUGE trader interest. Whilst the broader equity market is in algo bot melt mode (ahead of Friday jobs data).. the real action is in the mining stocks. The ETF of GDX is higher by a very sig' 5.6%, but with the metals set for much lower levels.. this is merely a 'crazy bounce day'. No doubt, many will be calling a key floor in the miners, but unless you think Gold is not going to the giant $1000 threshold.. this is merely another bounce, much like Monday. Bearish on GDX, 15/14s.. near term. 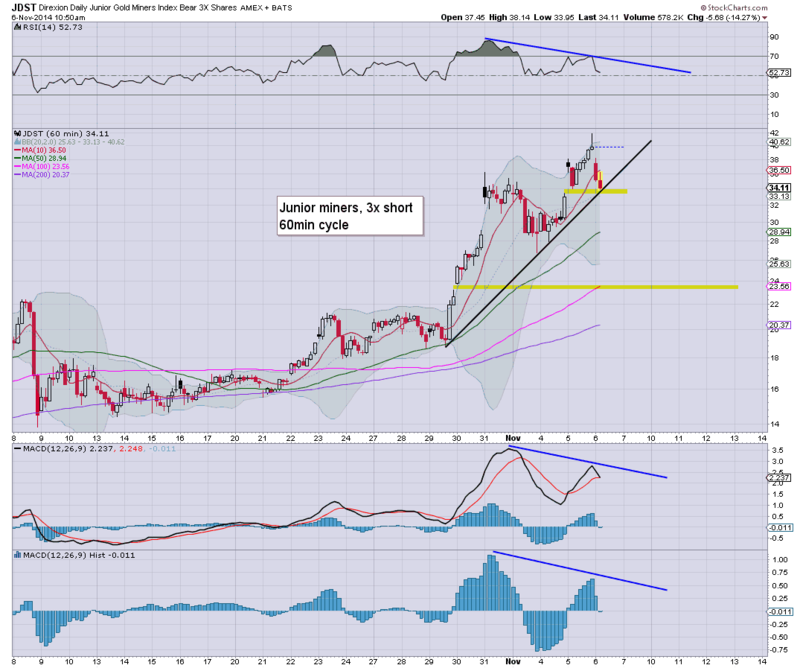 Although if Gold 900s next year, there is a viable possibility of 12/10. 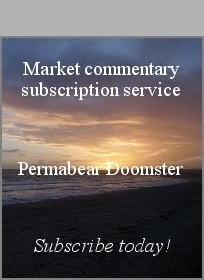 As for main market.. is sure is quiet out there ahead of the jobs data. VIX is reflecting this... u/c @ 14.17. Its getting real tiresome again with this kind of price action. Can we get a turn on monthly jobs data tomorrow? I hope so, because I'm really getting frustrated at this price action. Notable weakness, energy stocks... CHK -1.7% @ $22 - I've a longer term downside target of $12.. although that is entirely dependent on oil/gas prices continuing to remain broadly weak. The market has clawed back upward, and appears in algo-bot melt mode, sp' +3pts @ 2026. 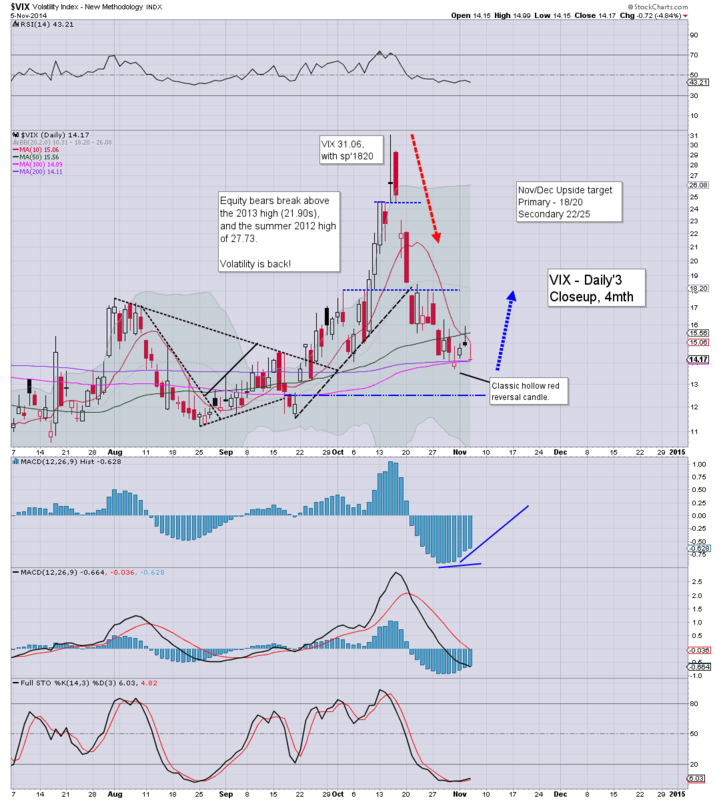 VIX remains subdued, holding minor gains +1% @ 14.30. Metals are relatively weak, Gold +$2. Oil is significantly lower, -1.5%. The equity action remains pretty dull... and until we see VIX break the Tuesday high.. into the 16s.. bears have nothing to be excited about. Mining stocks are bouncing, but as always.. they will be following the metals closely. The next wave lower on Gold.. whether tomorrow.. or next week.. and the miners will get another smackdown. US equities break a trio of new historic index highs, in the Dow, Trans, and sp'500 (2025). Even if a retrace begins from today, it does not negate the huge achievement the equity bulls have managed since mid October. Suffice to say, new historic highs in no less than 3 indexes, that is extremely impressive, the broader ramp from Oct'15.. continues. Equity bears need a daily close <2000, and that sure looks unlikely today. 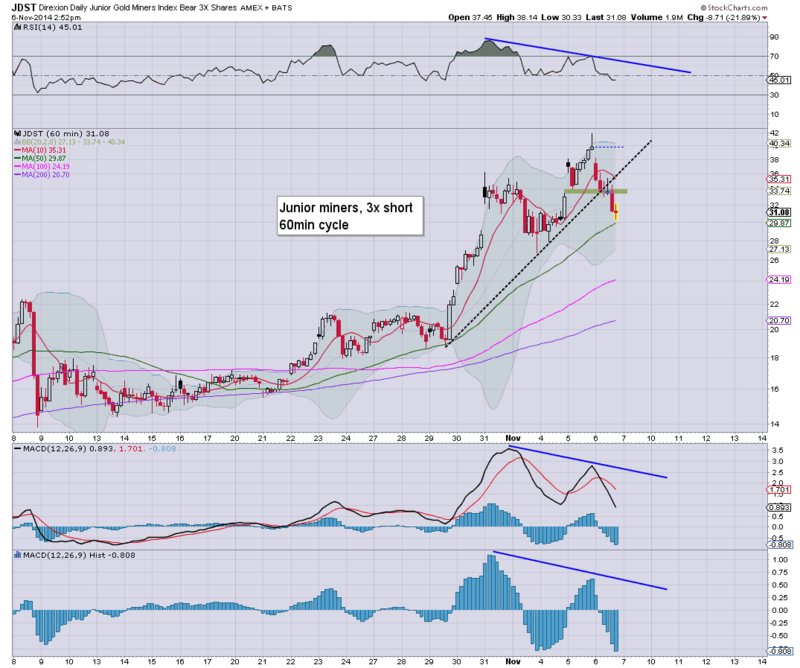 Metals are vainly trying to bounce, Gold +$3, but the real action is in the miners. A bounce.... is all it is. With Gold having lost the $1179 floor last week, there is EMPTY air until the giant $1000 threshold. ... if you believe Gold $1000, then you can knock off another 25/35% off the miners. 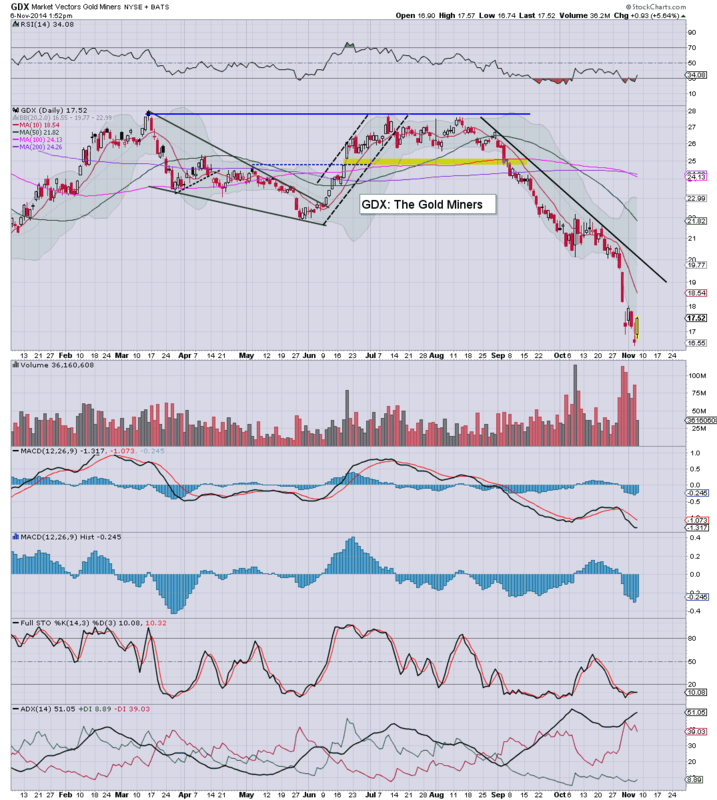 Notable weakness, JSDT -10.5% in the $35s.... short miner ETFs having problems on this bounce. 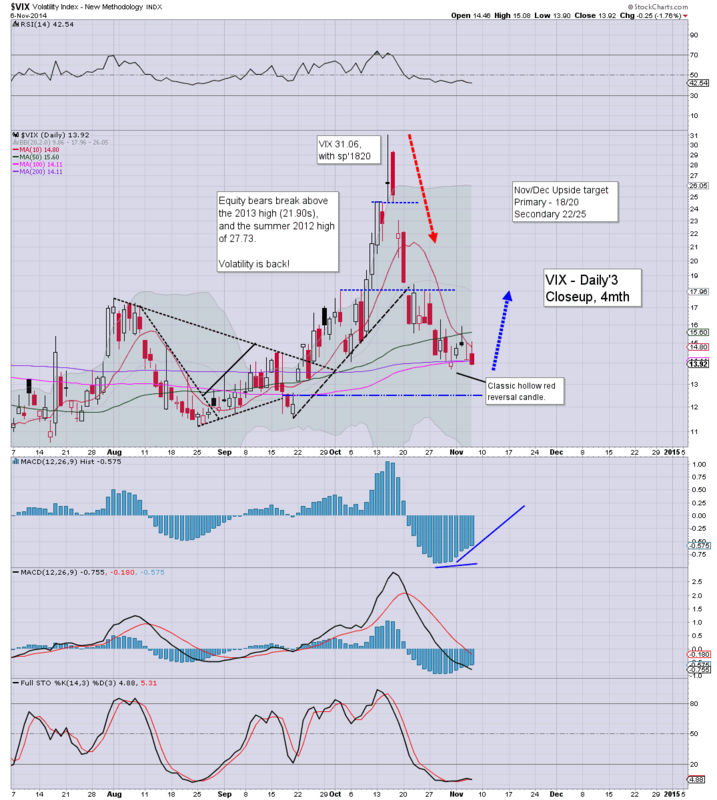 10.19am.. VIX breaks into the 15s... kinda interesting.. but will need 16s to clarify a new up cycle is underway. Good morning. Futures are marginally lower, sp -2pts, we're set to open at 2021. Metals are a touch higher, Gold +$2, which is helping the miners, GDX +1.5%. Oil is weak, -1.0%. 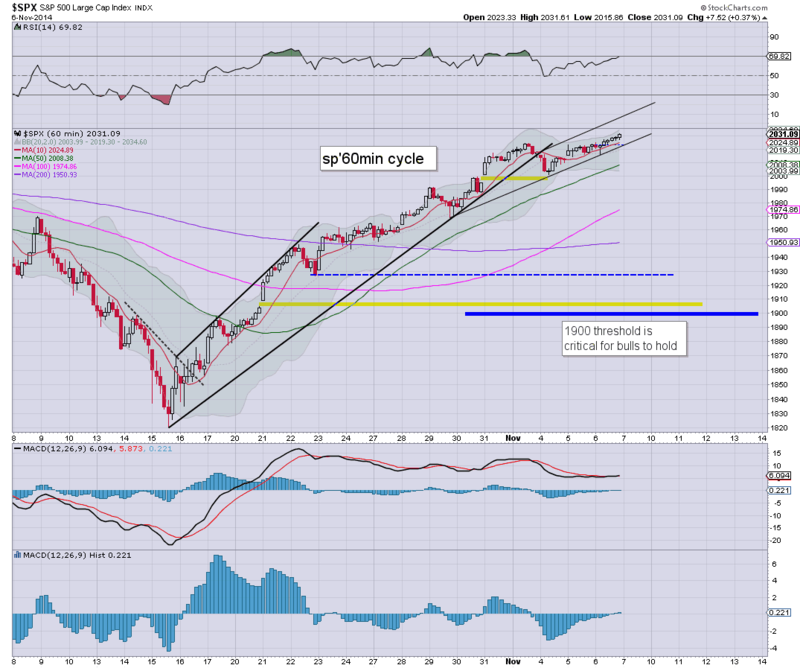 Unless sp' can break >2024, market looks vulnerable to a near term retrace. *jobs data is due, but really, the market these days doesn't really much care about the weekly data. The monthly data tomorrow will be far more important. 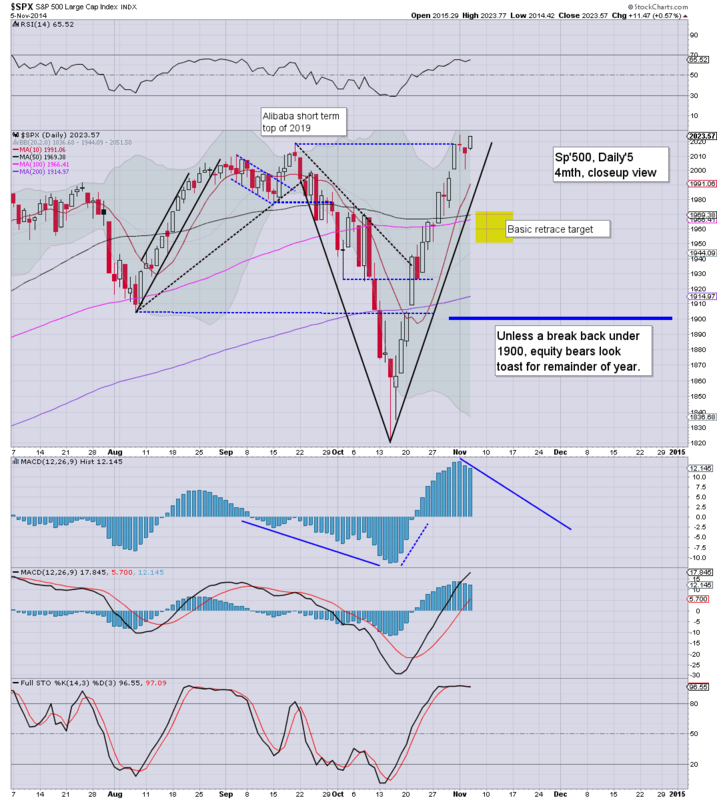 So... a little lower, and a viable double top on the sp'500. Overall, bears have nothing to tout until we break back under sp'2000, and even then, a retrace will likely get stuck around the 50dma - around 1970, next week. Interesting to see that Oscar is also seeing a double top.. sort of. 8.34am.. ECB chief... Draghi begins his press conf. Indexes a bit twitchy... sp +1pt.. 2024. 8.54am.. Market breaking upward.. sp +8pts ... 2031. Gold back to flat.... whilst Oil weakens.. -1.2%. 9.12am.. With the USD rising (Draghi is not helping the Euro).... Oil -1.8%. Metals trying vainly to hold fractional gains..
sp +3pts.. so.. we're still set to break new highs at the open. 9.45am... Opening reversal.... mostly suggested by the VIX.. but hey.. with new historic highs in THREE indexes... bears are pathetically weak still. 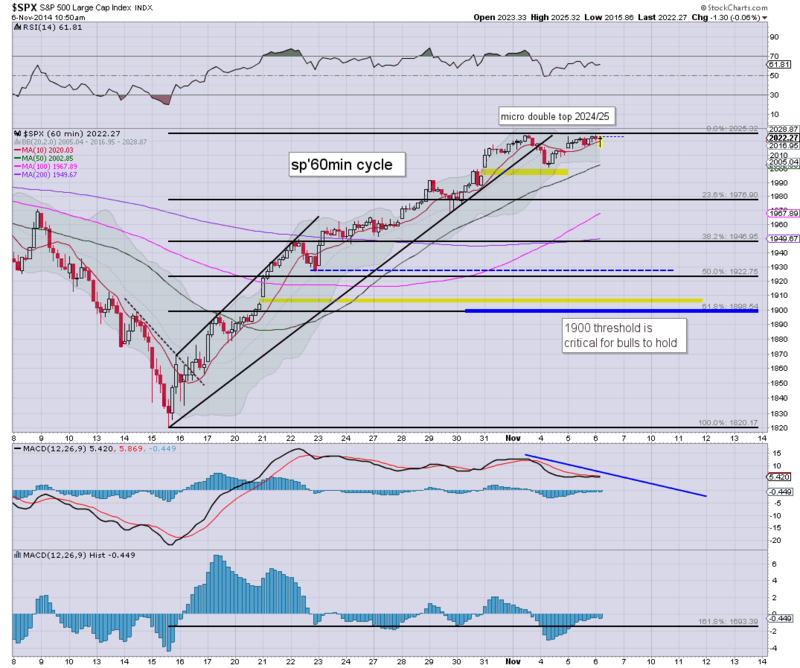 It was another day for the equity bulls, with a new historic high for the Dow (17486), whilst the sp +11pts at 2023. The VIX melted lower, settling -4.8% @ 14.17. The market remains well overdue a retrace.. if only 'moderate' to the 50dma in the low sp'1970s. Unquestionably, with a new historic high in the Dow, the broader ramp from Oct'15th continues. Price structure is offering an extremely broad wedge... but we're already at the upper limit. There is a viable micro double top on the sp'500, but considering the new Dow high, it is highly suspect as to whether it will hold for the remainder of this week. Volatility remains subdued, although is holding above the low from last Friday. Underlying MACD (blue bar histogram) continues to tick higher, indicating bullish price momentum (in equities) is weakening. First upside remains the 18/20 zone... the mid 20s look 'highly' difficult, even if the key sp'1900 threshold is tested before Santa arrives. Thursday will see the usual jobless claims and productivity/costs data. There is an an ECB meeting, and some in market land are going to be real disappointed if there is not further news on some kind of QE. Even more importantly, the market will be focused on the Friday monthly jobs data. It is also notable that Yellen is speaking (Friday morning) - along with other central bankers, at a Paris meeting. A retrace of some degree is of course going to happen in the near term. The issue is... how low? Right now, considering 'everything', a break under sp'1900 looks almost impossible. I noticed a new post from Redlinescenario this evening. 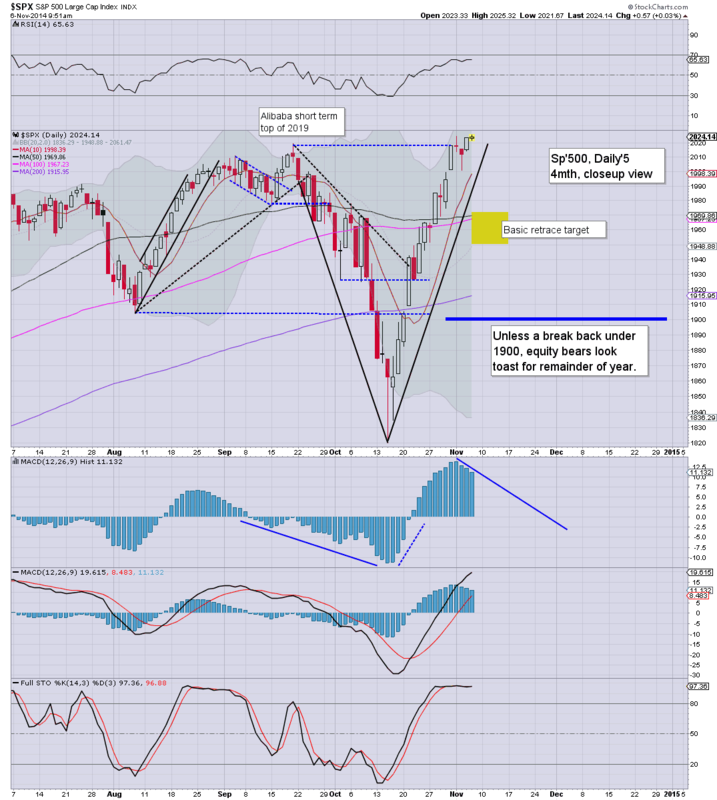 A fall to 1900.. and then another hyper-ramp into early 2015 would make sense. 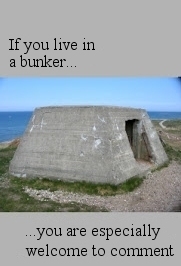 The only issue I'd then ask is... 'why would it stop there?' 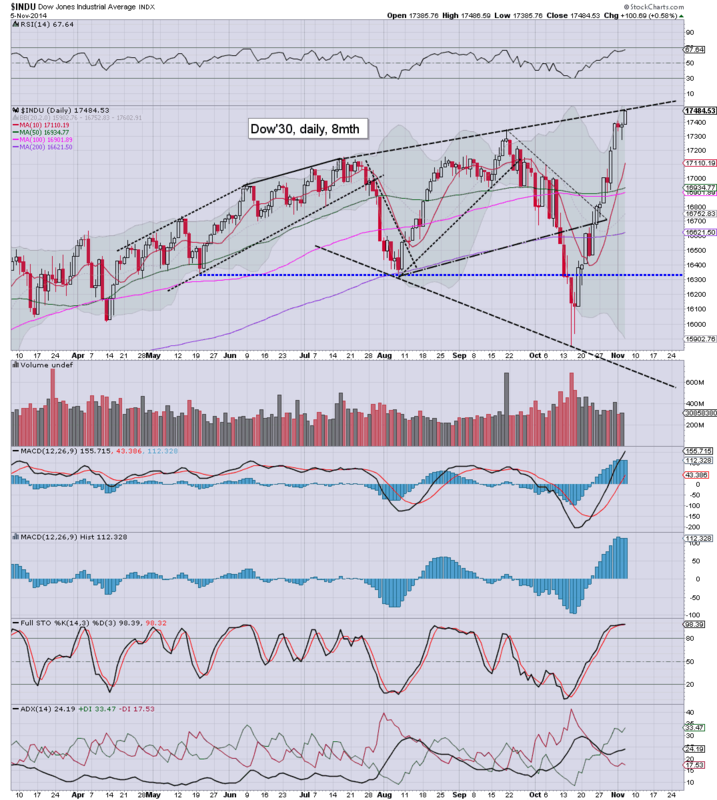 What happens if we see the R2K break above the double top high of 1212/13? Anyway, lets see how the rest of the week plays out. Two days is plenty of time for the bears to have a chance at knocking the market back <sp'2000, which would open the door to a further 5% across the next week or two.